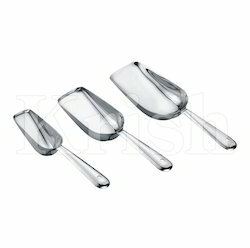 Our reputation in the market is largely judged in the market proffering the excellent quality array of SS Ice Scoop. They are available at the market leading rates. We are leading manufacturer and supplier of Ice Scoop. 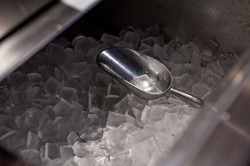 - The handle wraps around to provide a comfortable grip and the scoop features a wide mouth for larger pieces of ice. Weather you run an ice cream parlour or serve ice cream to your all guests, you will need this. Great care is taken while designing ice cream scoop which result in easy operation and maintenance. Their unique features like mirror polish, no sharp edges or joints, easy to clean and light weight make them a preferred choice of our clients. - Simple and easy to use and clean. Elegant and stylish, single cast design, deluxe ice cream scoop with mirror polish finish. Suitable for heavy duty use. We are offering SS Ice Chippers to our clients. Ice Scoop with steel handle.